Seven uncut episodes is a very sweet deal. You've probably heard all the anti-dub discussions that lead to flame wars already. But, this DVD release from Pioneer seems to be a large step forward in finally striking up a peace treaty between the two rival factions of the famous dub versus sub war. Since very little was cut out of the Optimum Productions/Cloverway dub to begin with, aside from transformation edits, certain violence, and other things parents don't want kids seeing on TV, the main brunt of the debates made come from the actual script of the show which made Haruka and Michiru, renamed Amara and Michelle, into cousins. But, you knew all that already since you taped every episode when they aired on TV and read all the posts on the net about the new episodes when they aired. No, the main reason someone would pick up the Sailor Moon S: Heart Collection I DVD is for the complete and unedited subtitled version of the first 7 episodes in full digital splendor. 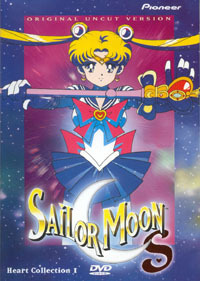 One of the definite things that struck me right from the start was the reversible DVD cover which has full foil versions of both uncut VHS covers so you can choose either Sailor Moon or Mercury and Jupiter to be on the cover of your DVD. But, the transparent plastic case allows for you to simply lift the disc and insert if you want to just see the other side of the cover without removing it. The DVD itself is rather nicely laid out. The menu is preceded by Sailor Moon doing her famous ‘Moon Spiral Heart Attack' and transitions have the rest of the sequence. In the way of extras, there is a rather simple gallery featuring some info on Sailor Moon with some production designs of her broach, wand, and fuku. There is also a nice creditless opening sequence complete with the Japanese Vocal and Karaoke versions of ‘Miracle Romance' as well as subtitles so you can sing along. In the case of this disc, I found the Scene Access menu to be one of my most frequented spots because I laid my viewing out over several days. Sometimes I would watch the Japanese version with subtitles and others the English track with subtitles and just compare the differences. Of which, there are far to many to name. In a way, the more I listened to the dub and read the subtitles the more humorous the edits became to me. So much so that I began to appreciate the Japanese version even more than I had in the past when I watched fansub versions. I was shocked when I realized that more than 95% of the lines were literally reworded and sometimes whole meanings of scenes were changed. So is the English dub really as bad as people have complained it is? That's really a matter of opinion. But, I will say that I was hoping for an uncut dub, but sadly I couldn't tell much of a difference, if any, other than the fact that the English theme song was played instead of the Japanese version during the opening credits. I was at least hoping for some cussing, but alas this is the English version of Sailor Moon and we can only hope to read subtitles of what is really being yelled in battle. The best performances come from Sailor Moon veteran voice actors, Katie Griffen and Susan Roman who voice Mars and Jupiter respectively. And rightfully so, they are the heart and soul of those characters for many fans and show just how good the dub can be. A welcome addition is Stephanie Beard (aka Suga Bay Bee) as the new voice of Rini. Stephanie just seems to fit the character's age more than her previous voice did. However, Linda Ballantyne as the new voice of Sailor Moon just doesn't fit well in the initial episodes of the S season. Her performance just comes off as over the top and as more of a cry baby, even though Sailor Moon had evolved out of that phase into a more mature person. The acting just seems like a regressing initially. Yet, the new voices did grow on me and it was nice to rewatch these episodes with a renewed outlook for how hard it is to ‘learn' to be such a high profile character and be ridiculed on the Internet for all your performance flaws. The only real draw back to this disc is in the sound department. The whole disc is mono. This means that the Japanese language track actually winds up sounding worse than the English track when played on a Dolby system. While some DVD players allow for 3D sound, I found that it was necessary to manually set my Dolby system to simulated surround sound and crank the sound up more than the midway point just to get the Japanese track to sound remotely like the English track in regards to background music and sound effects. I did try the disc on my Playstation 2 on a normal TV and have the sound feed through my VCR to my stereo and found much better results than I did on my Dolby system. For some reason, I just feel that something could have been done with the Japanese track to make it sound better than it does. All the various dub bashing aside, I am very supportive of the English version and have watched it religiously for as long as I've been an otaku. So let me just end this on a soap box, without the English dub we wouldn't have had the pleasure of seeing a ‘less' edited version of Sailor Moon on TV. We wouldn't have gotten to see the Outers in action. And we probably wouldn't have gotten this very DVD for quite some time. So do yourself a favor and pick up a copy of this DVD. Aside from the mono sound, you won't be disappointed.